Directions: mall To Medium 4.1 Oz., Large 7.8 Oz. For senior dogs. OK for dogs of all ages who prefer a softer dental chew. Recommended to help reduce bad breath, plaque and tartar. For Pet Use Only. 1-2 chewable bones per day. Maximum response with continual use. 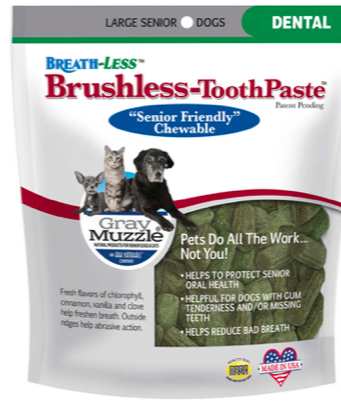 Brushless-ToothPaste SeniorTM responds on its own. For long lasting effectiveness we recommend you combine this product with Ark Naturals Plaque-ZapperTM.